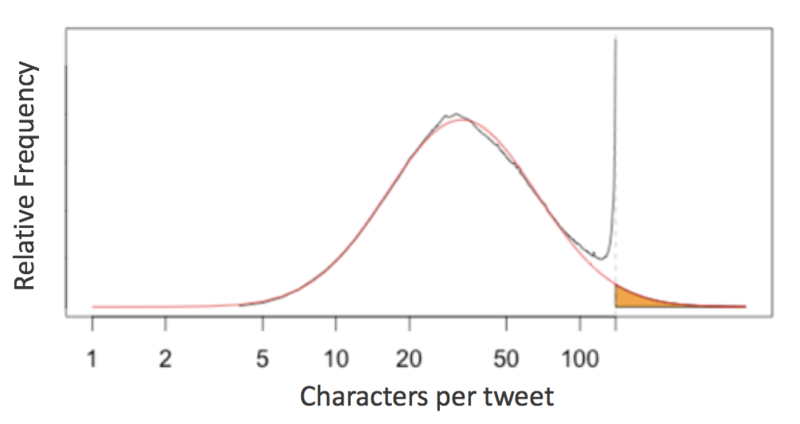 English language tweets display a roughly log-normal distribution of character counts, except near the 140-character limit - an evidence of cramming thoughts to fit 140 characters. Jake VanderPlas invistigated this for scientific python packages. Let’s see how it affects FluidDyn packages! To take a look at this, we first need a way to access all the raw lines of code in any Python package. In a standard system architecture, if you have installed a package you already have the Python source stored in your system. """Iterate over all lines of Python in module"""
Now this is looking interesting! It’s clear that many of these duplicates are just a manifestation of if __name__ == '__main__': line and some imports from python-future package recurring at the beginning and the end of many modules. That's a much cleaner distribution! """Plot a histogram of lengths of unique lines in the given module"""
The results here are quite interesting: similar to Twitter’s tweet length analysis, we see that each of these packages have a somewhat smooth distribution of characters, with a “cutoff” at or near the 79-character PEP8 limit! There is a reasonable adherence to PEP8 standards, but unlike the results from Jake’s analysis of other scientific pacakges, there are no recognizable “bumps” near the 79-character limit. fluidfft has the most cleanest tail with absolutely 0 lines with above 79 characters - a luxury of being the newest package. Seems like a reasonable fit! From this, you could argue (as the Twitter engineering team did) that the line lengths might "naturally" follow a log-normal distribution, if it weren't for the artificial imposition of the PEP8 maximum line length. This notebook originally appeared as a post on the blog Pythonic Perambulations. The code content is MIT licensed. This modified post was written entirely in the Jupyter notebook. You can download this notebook, or see a static view on nbviewer.